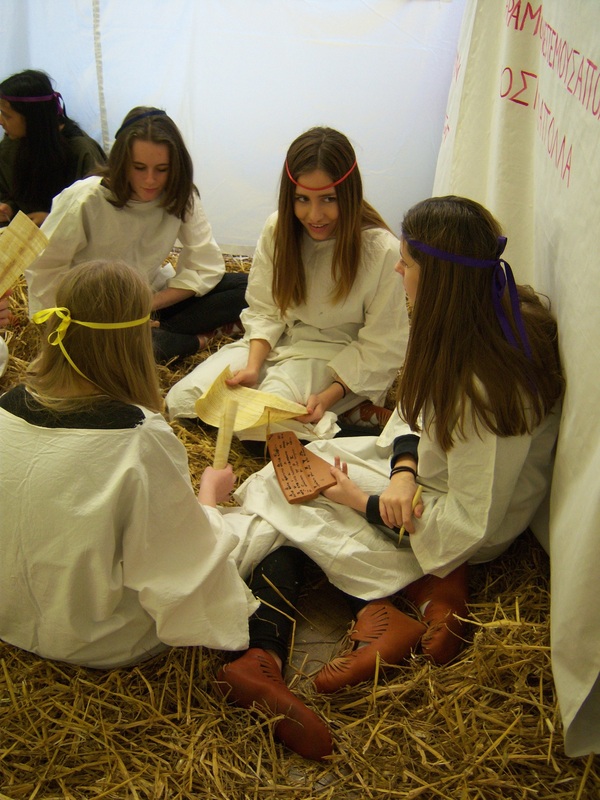 The Reading Ancient Schoolroom welcomed more than 100 participants to campus on 27th and 28th January. Groups from Farnborough Hill School, Leweston School, St Gabriels School, and Langley Academy, as well as numerous families and individuals, learned how to act like Roman children. Participants also read Homer from papyrus scrolls, wrote with styluses on wax-coated tablets, learned how to do mathematical calculations on an abacus and Roman counting board, wrote with reed pens and ink on ostraca, studied Latin from a textbook used by ancient Greek speakers to learn Latin, learned the Greek alphabet the way a Roman would have learned it, and recited poetry from memory. There were also opportunities to handle objects in the Ure Museum. Participants ranged in age from 4 to 18, and all reported having a great time. Volunteers, who included numerous first-year undergraduates as well as graduate students and staff, also had terrific fun; this is good as no-one is paid for work on the schoolroom. So we are EXTREMELY grateful to all our hard-working volunteers!